The city of Mississauga is switching its streetlights over to LED. The program was announced over a year ago in a city hall announcement. All 49,000 street lights will be converted from the yellow-orange light of traditional High Pressure Sodium (HPS) to the more natural white LED lights. About 25% of the lights have been converted to date. "The new LED street lights will significantly reduce maintenance costs and should result in a 55 per cent reduction in future energy consumption for the City. LED street lights will also increase safety, visibility and reduce light pollution in the sky" according to the announcement. 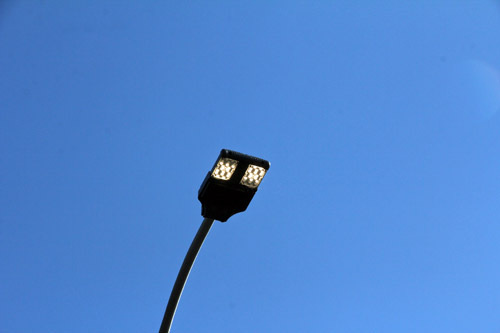 LED street lights reduce the amount of light pollution. They are compliant with the International Dark-Sky Association (IDA) in terms of being dark-sky friendly by reducing sky glow. The Mississauga Centre of the Royal Astronomical Society of Canada is obtaining a light meter to use to measure the bright ness of the night sky. Members will take measurements from different parts of the city over a period of time to try and detect a change in brightness due to the change in streetlight design. We will continue to monitor this changeover and report on any difference in the brightness of Mississauga's night sky. The first evening with LED streetlights - quite a change.